I live just outside of Plymouth with my husband, two young daughters, and two crazy dogs. The juggle can be a bit overwhelming, but being creative keeps me sane (ish!). I grew up dinghy sailing with my family at the weekends. At school I particularly enjoyed hands-on creative classes like textiles and technology. When I left full-time education I dreamt of exploring the world under sail, and I sort of did for a few years… with jobs varying from driving a harbour master patrol vessel, to being stewardess on a super-yacht. 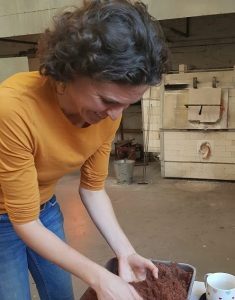 A job as marina dock-master brought me to Devon, and a chance visit to Plymouth College of Art reawakened my creative side; after watching the students skilfully manipulate the molten glass I found myself filling out an application form! I now live on the outskirts of Plymouth, so we’re just a short drive from beautiful Dartmoor, windswept beaches and picturesque towns. I love to go out exploring with my daughters and dogs (and when he’s not away at sea my husband too!). Our family outings inspired my Miniature Scene series, focusing on the way in which we interact with the world around us. This year I’ve set aside time to further explore cold-work processes, and to develop a new series inspired by my love of the sea. More info here. 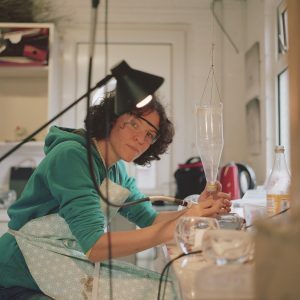 plus half-day workshop sessions teaching the more accessible craft of glass etching using a chemical cream. Details of future courses may be found here. If you would like to be kept up to date regarding events, special offers and new designs then please sign up below. I promise not to flood your inbox (maximum of 6 emails per year). Should you wish to unsubscribe then please just click the link at the bottom of any newsletter that you receive, or email me. I promise not to share your details with third parties. I agree to receieve newsletter from Jenny Ayrton as per description above.